Russian bots use 'em - as do me n you. NOT ANY MORE FROM THIS BOY. Memes can kiss off. 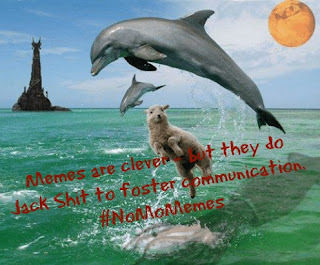 Imagine, if you will, an internet with no memes. Close your eyes - inhale for 4 seconds - hold that breath for 4 seconds - exhale for 6 seconds. Repeat. Now imagine your daily internet-social media experience sans memes. One of the driving forces behind the internet was to foster communication. It was supposed to open a world of possibilities - broaden our horizons - instead it is narrowing our scope to the point that we express ourselves in tweet size bites of sarcasm. We sum up hugely complex issues with one or two short sentences juxtaposed on a picture(s) that PROVES OUR POINT. I like to buy things made in the US when ever it is possible. Is it going to change the world? Nah. Is it going to save American jobs - well, it sure can't hurt. 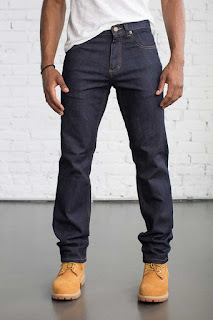 In fairness, the Dearborn Denim jeans are made with some stretchy stuff in addition to just cotton, so of course they would be lighter. They are 78% cotton with some polyester and a wee bit of spandex.